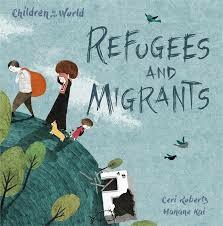 Refugees and Migrants (Children in Our World 1), Ceri Roberts, illus. Hanane Kai, London: Wayland Books, hb. 978 1 5263 0020 1, 2016, £12.99, 32pp. 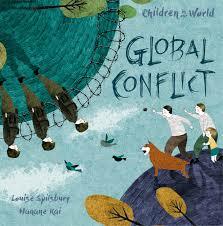 Global Conflict (Children in Our World 2), Louise Spilsbury, illus. Hanane Kai, London: Wayland Books, hb. 978 1 5263 0050 8, 2016, £12.99, 32pp. Another Wayland series dealing with the issue of refugees and migrants is the four part Children in Our World series, a picture-book series that aims to help children make sense of the larger issues and crises that dominate the news. The issues are presented in a sensitive and appropriate manner. These books use relatable comparisons, carefully researched text and striking illustrations. Roberts’ book, Refugees and Migrants, deals almost exclusively with those fleeing military conflicts. Roberts presents a valuable initial formulation of the basic issues. Kai’s illustrations, as ever, add a valuable human dimension to Roberts’s work. Roberts finally presents a section outlining what children can do to help. Global Conflict, also a book in the Children in Our World series, provides a further perspective in a sensitive and appropriate manner to broaden understanding and amplify discussion about the larger issues and crises that dominate the news. Spilsbury seeks to explain the language in which conflicts around the world, wars and uprisings, are described; how and why they arise; and draws attention to a major consequence that follows violent disruption to everyday life, that people become homeless and/or refugees. The book distinguishes between war and terrorism. Attention is drawn to those who are responsible for keeping people safe, how conflicts may be resolved, and, importantly, the role of international relations as a means of avoiding conflict is emphasised. Bringing the subject closer to home, young readers are given advice on where they can learn more about the subject, but most pertinently how they can avoid conflict. Here Kai’s illustrations are warm and human. They remind the reader that those involved in conflict are real people: men, women and children. ‘If you prick us do we not bleed?’ All these books offer a valuable opportunity to young children, guided by an adult, to begin to explore and gain some understanding about the violence in the contemporary world. Children will be aware of these issues through the intensive coverage and distribution of news.